Hey guys! Thanks so much for the love on our Bedroom Makeover in my last post. It's been a labor of love and nice that it finally feels like our own special retreat. With all three kiddos headed back to school here in a couple weeks, not to mention our oldest heading into the teenager years (was she not just born? ), I think I'll be more ready than ever to head there at the end of the day! We've made some major progress in our beach house dining room with the new buffet cabinet (thanks for helping me vote on Instagram! 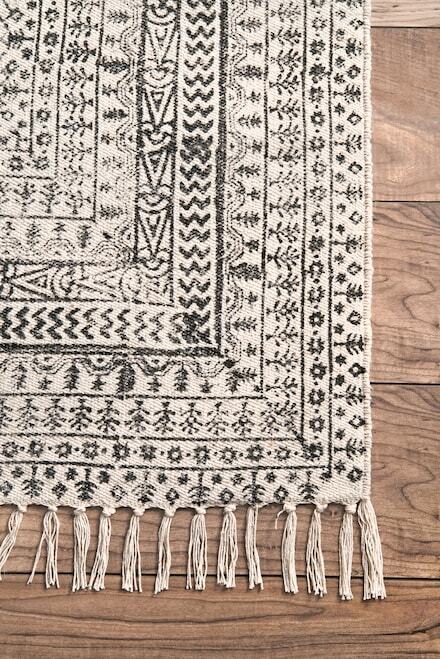 ), and the capiz shell chandelier and braided jute rug are both set to arrive later this week. I can't wait to share more, but the next item to decide on are dining chairs. 1. We have 5 human beings using the dining space everyday for a variety of things from eating to crafts to computer time. A few of those humans are smaller (well....actually nope, not anymore) and sometimes a little messy (definitely still this). 2. It's a tight space. The round table is 44" diameter and the scale of the dining chairs needs to be pretty small but still comfortable. 3. We don't want to block the view. We're currently just using these stacking metal stools which is nice because they don't block the view, but a low back chair would be nice for more comfort. With that said, I've been scouring the internet for something that fits our style, budget, and scale. 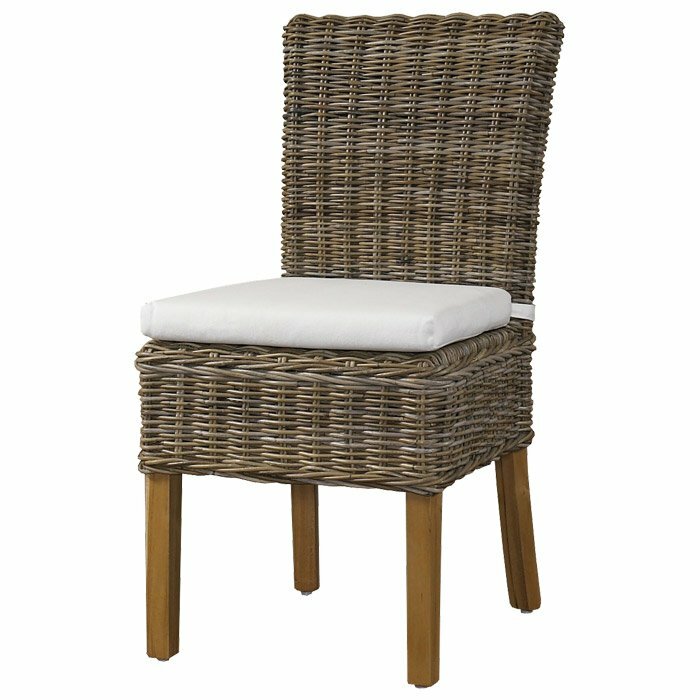 I have it narrowed down to about 4 options, but since it has been something I've spent hours on, I had to share some of the best dining chairs I come across that really fit that coastal aesthetic! If you're on the hunt for some coastal style dining chairs, these are all great options. When you hover over the photos in the roundup below you can see a listed price. Keep in mind this may be for a SET of chairs AND many of the chairs are available in different fabric options or stain and paint colors. Let me know if you snag any of these and best of luck! 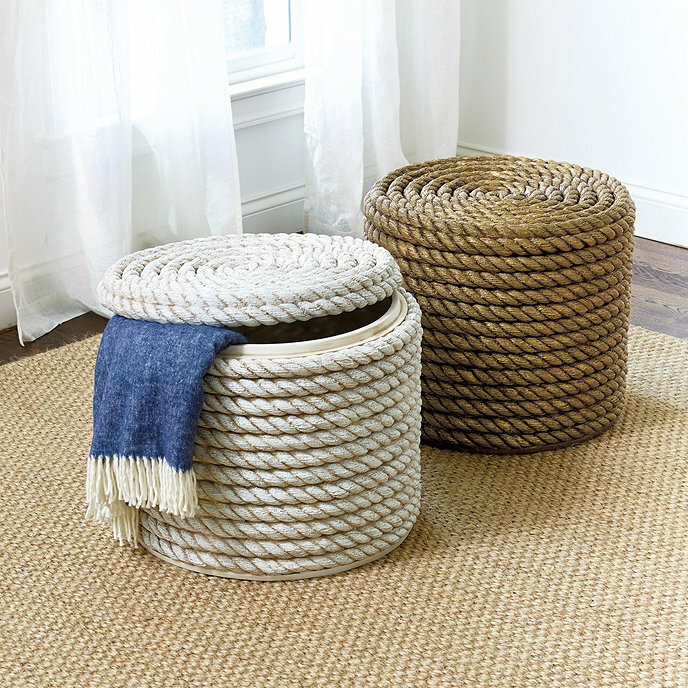 The four options I'm currently considering for our beach house are the Boca Kubu Side Chair, the Sawyer Cross Back Chair in white, a Slipcovered Parsons Chair in white, OR sticking with a backless stool option like these Rope Storage Ottomans which double as seating. I just don't know yet! Any help is welcome! 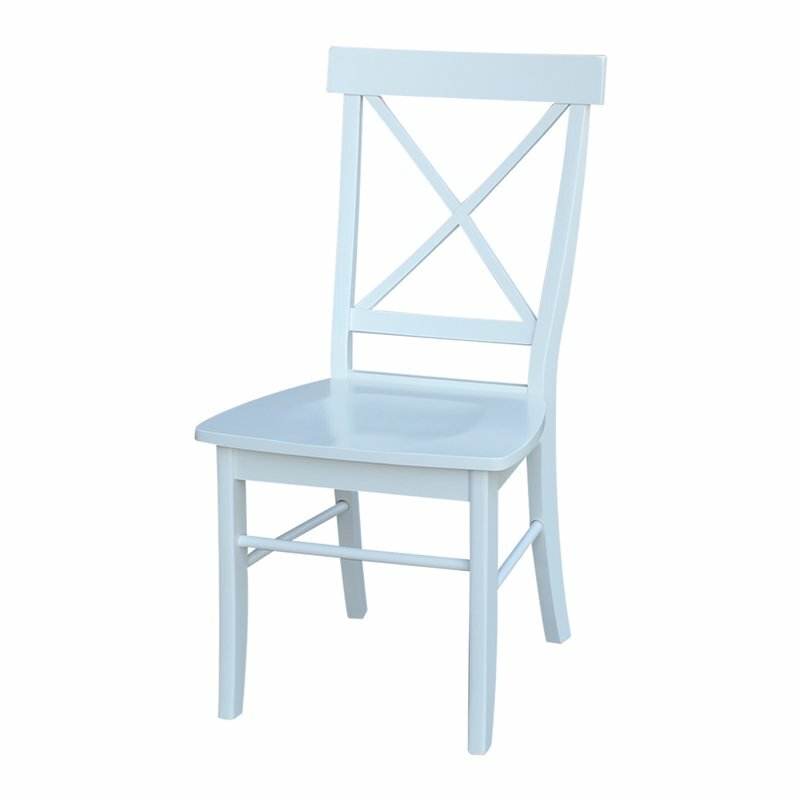 The Tilden Spindle Back dining chair from Pottery Barn is a top contender for our own beach house. It fits all of the criteria, although I'm not sure if I'd rather go for vertical spindles or an X back. *Dislclaimer: This post is sponsored by Serena & Lily. All opinions and design choices are my own. A big THANK YOU to Serena & Lily for partnering with me and sponsoring this post. Affiliate links are included below. You guys!! It's finally about finished! Our Master Bedroom at the Beach House has been work in progress for quite awhile. I mean.....please tell me I'm not the only one who tends to focus on all the OTHER spaces in the house before the master bedroom. Of all the rooms that people tackle in their homes to update, I've discovered that the Master Bedroom is often at the end of the list. Who doesn't like to focus on the kitchen and living spaces, making their kid's bedrooms special or the guest room comfortable? 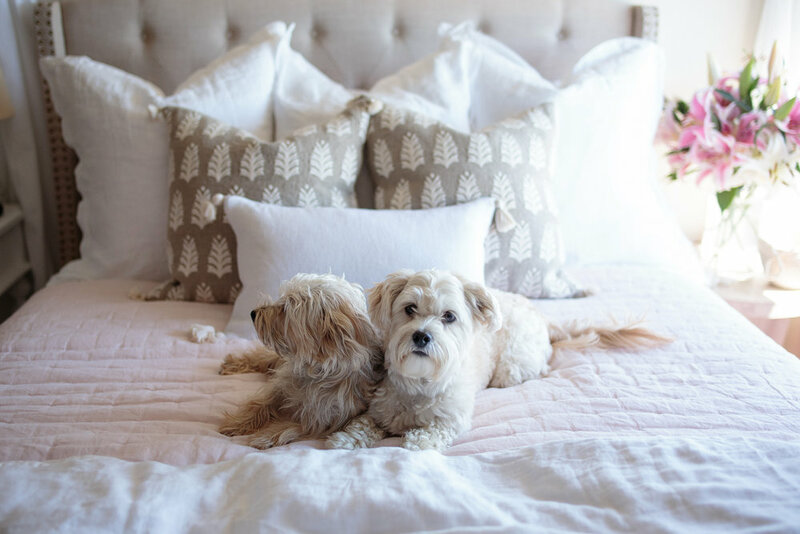 This has been the case for us, and I'm honored to partner with one of my favorite brands, Serena & Lily to transform our bedroom into a relaxing retreat. Talk about a pinch me moment! If you have been putting your bedroom off for quite some time, rest assured it doesn't take much to pull together a beautiful and sophisticated space. You absolutely deserve it to end your day in a room that brings you joy, calm, and a good night's rest....a place just for you. It's also worth mentioning that you can't see the bright orange closet doors. Haha! I've painted the majority of the doors and trim throughout the house to Benjamin Moore's Simply White and LOVE it. Other colors in this makeover are at the end of the post. It may not seem like a big deal, but at the end of the day when I walk into our room, it's just so peaceful and calming. I really wanted the bedroom to feel like a casual chic oasis of sorts while still sticking to our Pacific Northwest roots. The white linen duvet cover and shams make me feel like we're on vacation every day, with that classic beach house vibe. I almost chose a different color (there are five options! ), but I know that as I change small items seasonally in the bedroom, the white will be a key staple bedding item that will last for years to come. The Sutter linen quilt in pink sand adds a feminine touch without being over the top. It's a great light weight option while still adding warmth (and layers in the colder months). 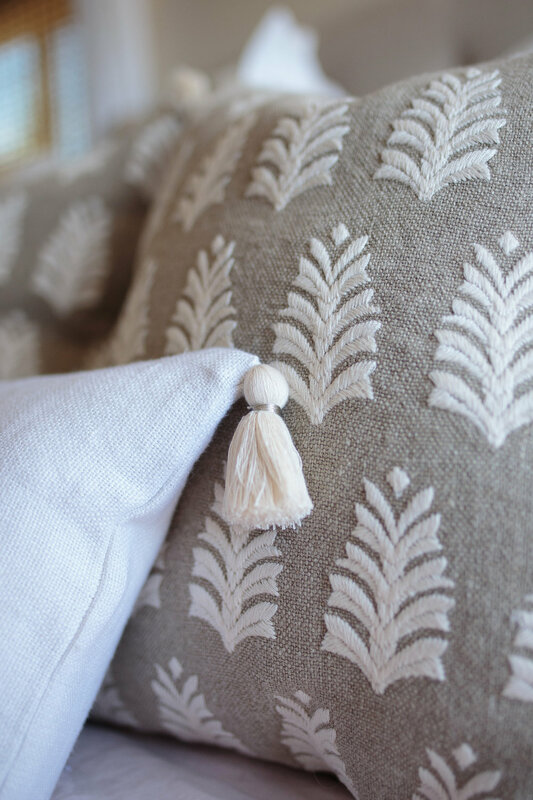 The Whitley embroidered pillows in Flax are something I've had my eye on for awhile. They are so stunning in person and the quality is top notch with the embroidery on both sides of the pillow cover. Quick tip: if you're looking to create a fuller look to your pillows, be sure to use one size larger on your pillow insert than the cover. The Eva Tassel Pillow Cover in white finishes off the bedding ensemble in the front. One thing I love about Serena & Lily's pillows is how they all coordinate effortlessly together. When you turn to the foot of the bed, you get a better idea for the size of the bedroom, which we love and make it work for us. 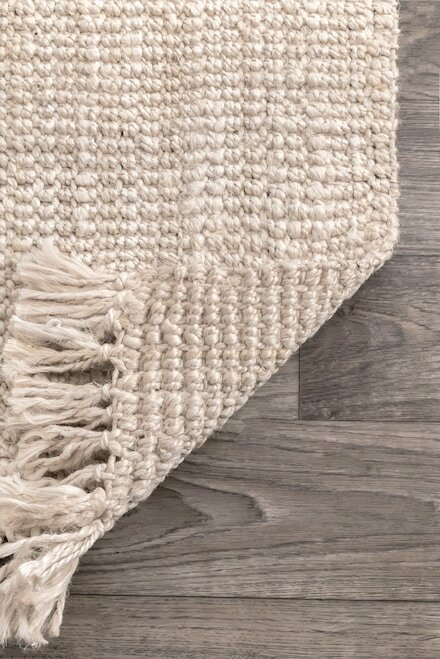 The Tulum Rug was such a key piece in grounding the entire bedroom and also lightening up the room since the floors (which came with the house when we bought it) are much darker. The neutral rug made such a HUGE impact in the entire bedroom coming together! 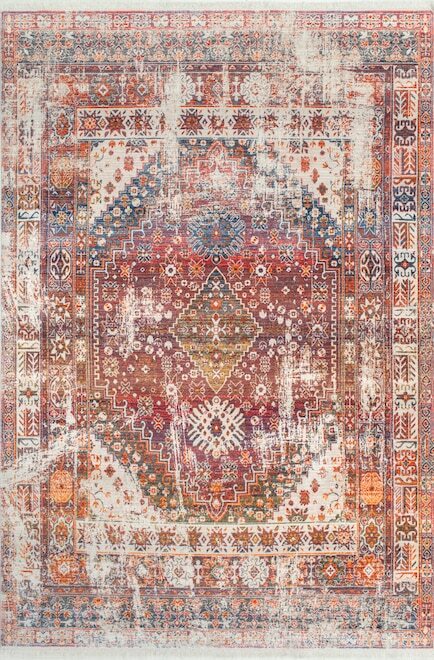 The pattern is subtle and adds just enough interest while being anything but boring. The Beaufort Tray is something that can move around our beach house as needed, but for now sits nestled on our bedroom dresser (a piece I repainted) to corral small items such as my go-to earrings, plus greens or a vase of flowers and coastal shells. This is an extremely sturdy tray and the mix of raffia and seagrass makes for a beautiful set up no matter where you place it! Here you can see a better view of the Tulum Rug and another favorite of mine, the Topanga Pillow Cover in blue. I like to say it's "Copper Approved", since this is one of our maltipoo's favorite hang out spots. 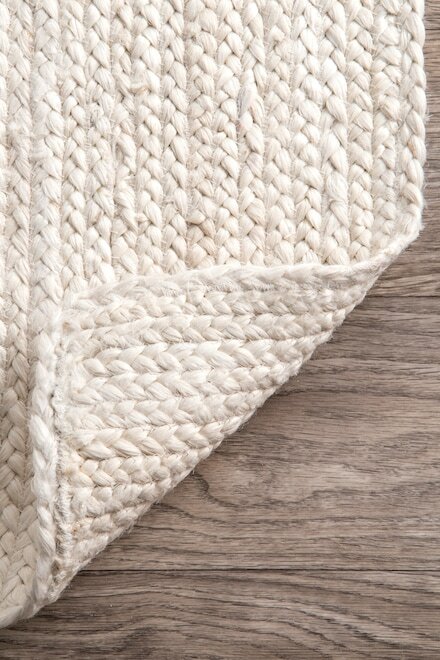 The medium Tassel Basket below is also a great size for storing a handful of throw blankets (or books, toys, etc.). 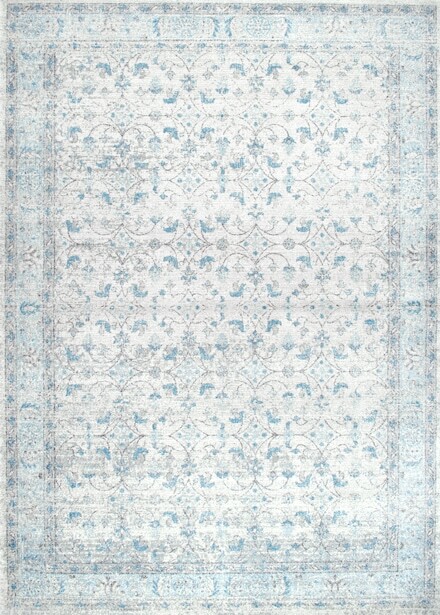 Blue is one of my favorite colors and I love the touch of color it brings to the room. The round Sandbar Tray is one of my personal favorites of all Serena & Lily pieces and is an instant classic for any beach inspired home. 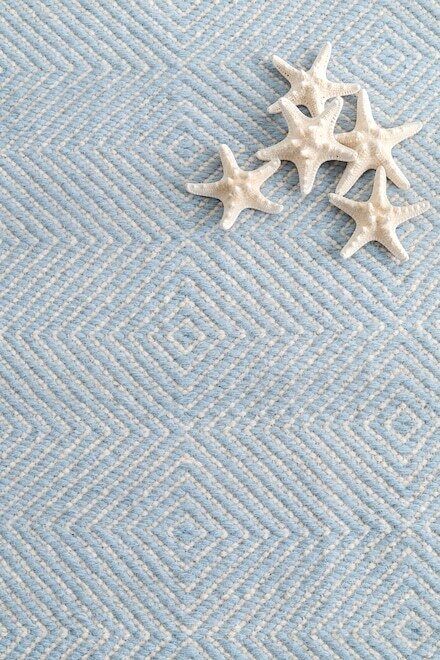 The seagrass is beautiful and chic, as well as extremely versatile and functional. Thanks so much for checking out our beach house master bedroom makeover and I hope it inspires you in your own home endeavors!